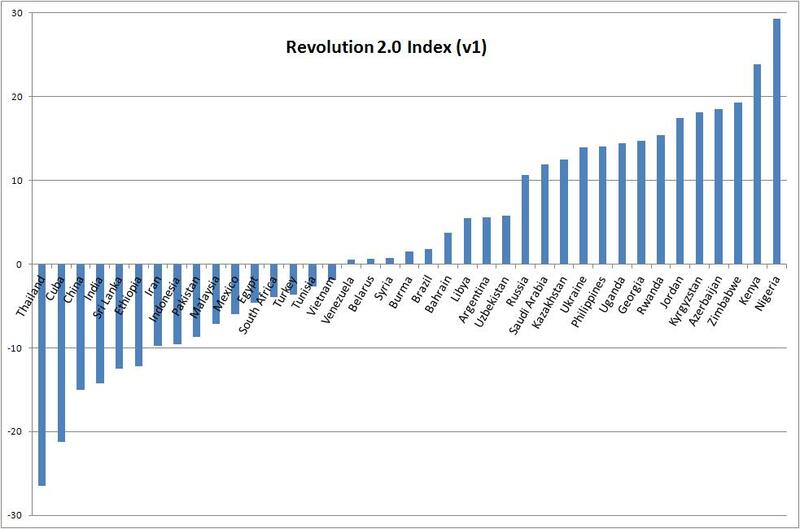 Home > Development 2.0, e-Politics in DCs	> The Revolution 2.0 Index: Where Will The Next “Arab Spring” Occur? June 2013 update: the mass national protests in Brazil could be seen as a small validation of the Index, given Brazil is in the top five. Less easy to read recent protests in Turkey (which is just slightly in the top half of the Index) which seem to fall into a ‘deep but narrow’ categorisation. The focus of our work in Manchester is developing/transitional economies so only those are included. But you could readily calculate for US and other OECD countries by looking up the stats in the three indexes linked above and performing the calculation as shown. Your model is well reasoned and clear, and its identification of Ukraine as the most likely country suggests that it’s capturing something meaningful. Until you specify what you mean by “revolution” or “protests,” though, it’s impossible to objectively evaluate the model’s performance. Would recent events in Thailand qualify? Based on your comment about Brazil, I would assume so. But what about recent unrest in Burkina Faso, or Guinea, or Sudan? To evaluate this as a predictive tool, we need to know ahead of time what would count and what wouldn’t. Otherwise, it’s too easy for confirmation bias to run the show. Thanks. Yes, as noted, the model was developed as a teaching tool to explore the input factors, not seeking to make predictions. If one wanted to develop it further then the dependent variable would need to be better identified. Non-electoral overthrow of the existing regime would be a start. That’s the revolution component, but then one would also want to look at the 2.0 component; making some call on the extent to which ICTs had been involved. 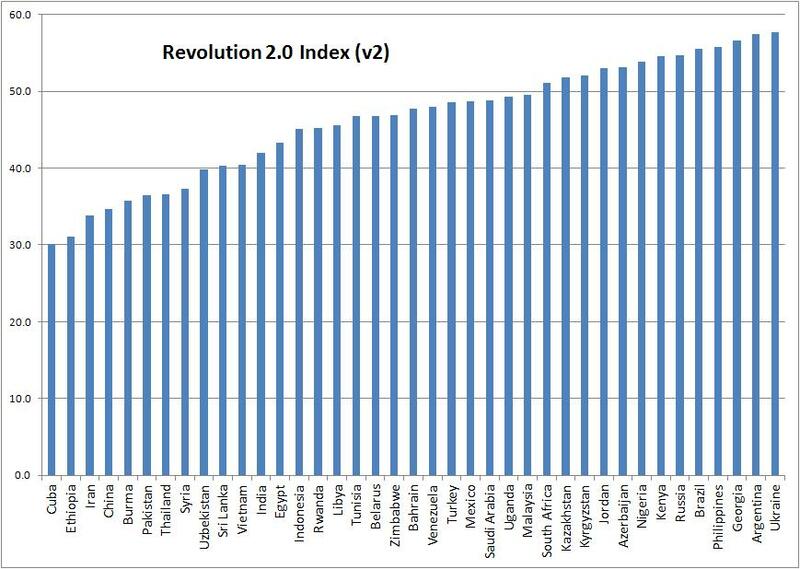 Plus we need Freedom House to rank a wider range of countries – Sudan has joined the 2013 Freedom on the Net report but not Burkina Faso or Guinea. 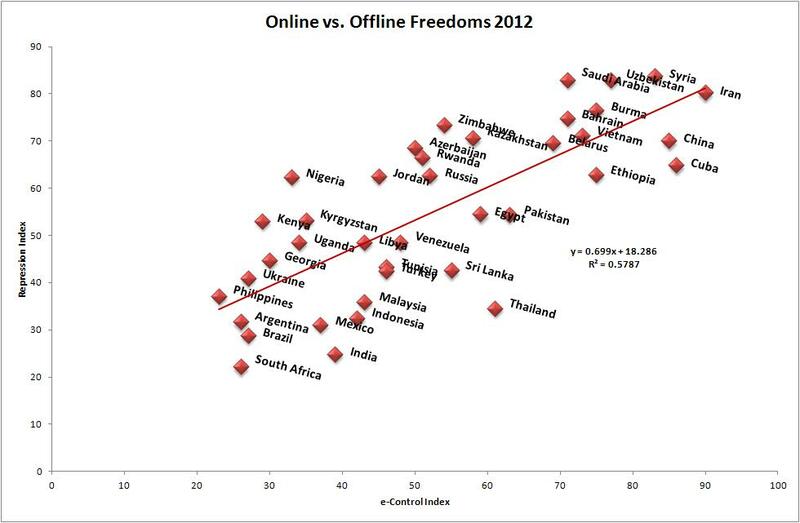 Freedom of ICT implies also free access to extensive IT knowledge.